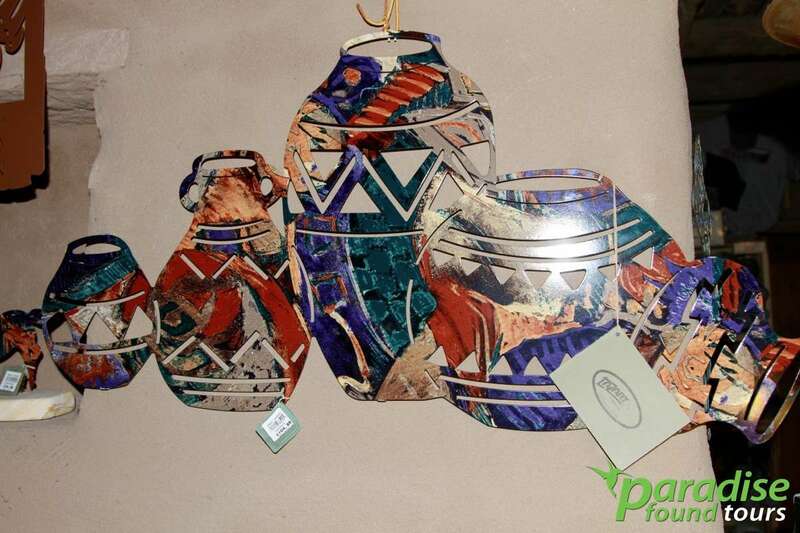 The Grand Canyon Hopi House is known as the first gift store at the Grand Canyon South Rim. Once inside the Hopi house, you’ll notice the native architecture; the ceilings are made with layers of saplings and timbers. There are beautiful adobe walls and fireplaces set perfectly in the corners. A truly remarkable design by Mary Elizabeth Jane Colter (She also designed the Desert Watchtower). 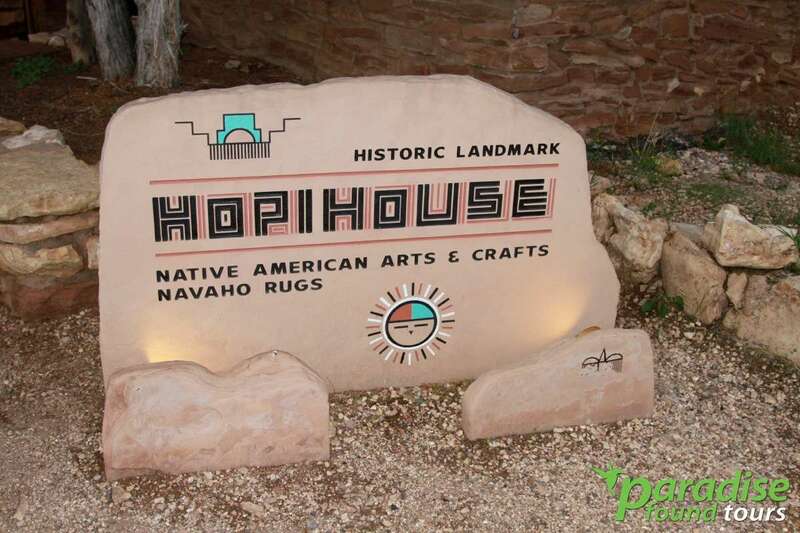 The Hopi House is the place where are all connoisseurs go for real Indian arts and crafts. And it’s impossible to miss because it’s designed after an actual Indian pueblo. Which is actually quite interesting because the structure is unlike anything you’ll encounter. How so? Well, it starts with small doors and the adobe walls and the Saguaro cactus ribs that line the roof. It’s obvious the minute you stoop to get through the main door that’s probably no more than 5 feet high. The design and construction of the Hopi House was assigned to Mary Colter by the Fred Harvey Company. The relationship between Colter, The Fred Harvey Company and the National Park Service lasted a good many years. Originally, Mary’s vision of the Hopi House was to make it like a living museum. The Hopi Indians could live in it while they ply their native trade of traditional arts and crafts. The architecture resembles the original Hopi dwelling spaces that could be found within Oraibi, Arizona. Hopi craftsmen were the ones to complete the Hopi House. The 3-storey structure was mainly made out of adobe masonry and local stones. Even the way on how it was constructed was faithful to how the real Hopi natives would do it. Timbers taken from the adjacent forests made up the columns. Layers of saplings were woven together, completing the ceiling’s layout. Colter’s intention was to blend together natural building materials and fuse it within a cultural building. Like in the olden times, man had to make do with the available resources. Humans became creative and shaped the function and the form to build their dwellings. Architect Mary Colter also had an idea in mind for the Hopi House’s interior. It had to reflect the native building style and design of the Puebloan tribes. When you enter the Hopi House, you’ll be greeted by low ceilings and small windows that keep the desert heat out. The air circulating within is cool and refreshing. Furthermore, accentual building materials line the design interior. Adobe walls, corner fireplaces and wall niches add to a cozy atmosphere. The Hopi House still holds a ceremonial altar and a distinctive Hopi sand painting. The chimneys were cleverly made with pottery shards that are cemented in place by mortar. Construction of the Hopi House was finally completed on January 1, 1905. Almost all of the Hopi natives who contributed to the building’s construction stayed and lived in it. The artisans demonstrated how they could make intricate jewelry, pottery, blankets and crafts that were for sale. The Grand Canyon Hopi House has many terraces featuring local stones as steps, and ladders that were made using treetops. All the rooftops have a porch above the apartment. The Hopis could relax atop their homes as the day draws to an end. The magnificent views of the Grand Canyon may be seen and shared among fellow artisans. The Navajo and the other tribes often gather around and sing traditional songs as well as ceremonial dances. In fact, the tribes’ daily dance has become a part of the Grand Canyon National Park. Both National Park Service and Santa Fe Railway are actively promoting the 5pm event. The building opened with the 2nd floor as an exhibit for fine Navajo artifacts. 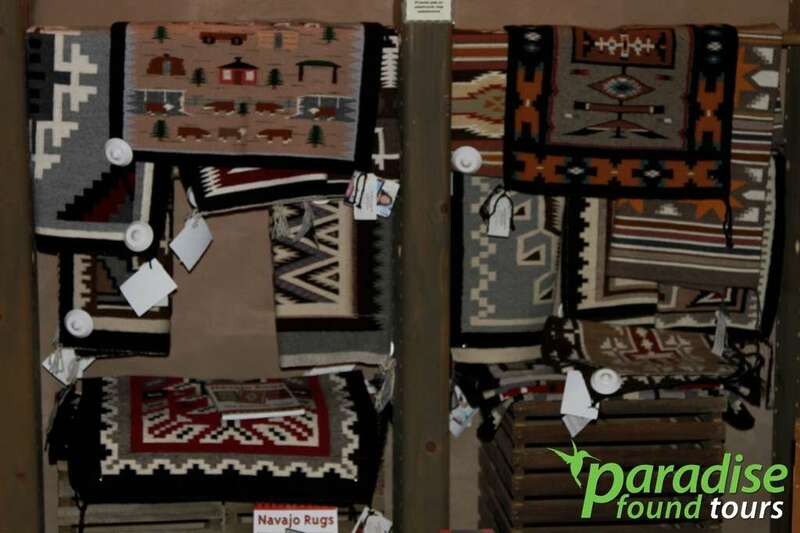 Ancient traditional Navajo blankets were on display, and some of them even won the 1904 St. Louis Fair. The crafts were then put on the Fred Harvey Fine Arts Collection, touring venues in the US. Hopi religious artifacts were put on display at the shrine room, and Hopi paintings lined the stairway walls. Hopi House was classified as a National Landmark in 1987. Today, Grand Canyon Hopi House is one of the most-visited tourist attractions in the Grand Canyon National Park. The puebloan-style abode houses the largest gift store shop this side of the Grand Canyon. The interior also hold a demonstration space and museum for visitors. You can still catch a glimpse of the remarkable Hopi craftsmanship the Hopi House is known for since its completion. 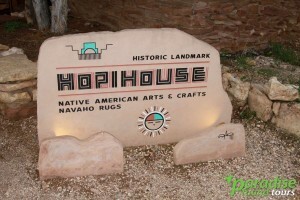 Yes, everything about Hopi House is unique, and that extends to its amazing collection of figurines and jewelry. Many guests gravitate to the turquoise jewelry collection or the wooden, sacred Kachina Dolls. If you’re with young children, keep an eye on them. Breaking stuff in the House will set you back a pretty penny. As for getting a photo of Hopi House, it’s tough. The structure is very wide and square and catching the light just right takes patience. Using a wide-angel lens is recommended. 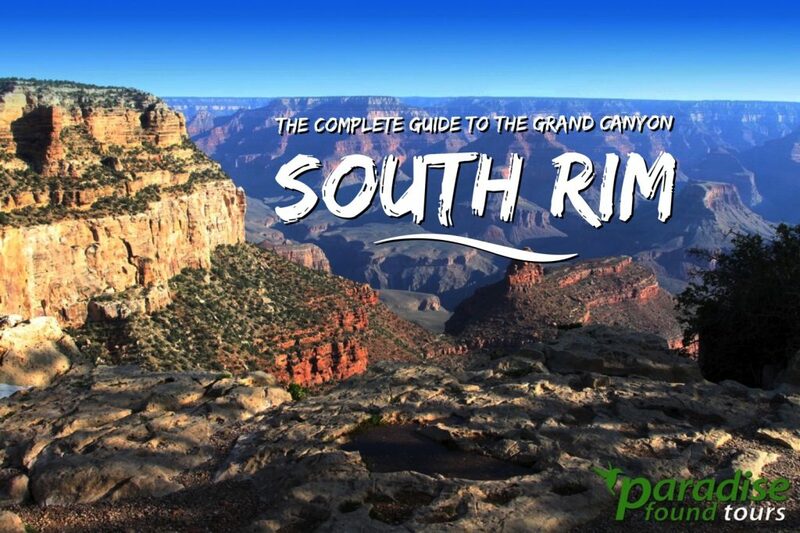 It’s really a sight to behold and we encourage you to add The House to your list of things to do as you explore Grand Canyon Village (Hopi is situated between El Tovar and Verkamps, all of which are east of Bright Angel Lodge). 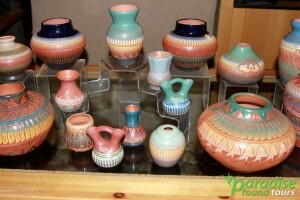 Understand that the Grand Canyon Hopi House is not the cheapest option when it comes to souvenirs. In particular t-shirts. If you’re in the market for those, we strongly urge you to head back to the Bright Angel gift shop. They have a tremendous selection (along with a billion other things) and prices are usually lower. 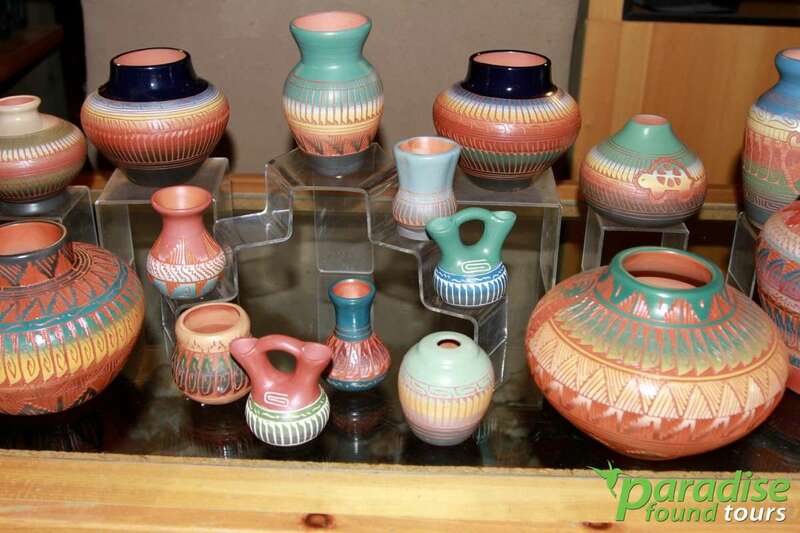 The Hopi House at the Grand Canyon’s South Rim is famous for it’s collection of Native American pottery. 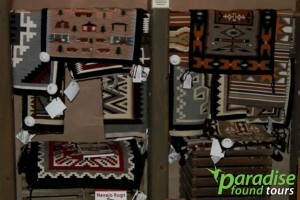 Hopi House at the Grand Canyon South Rim is a great place to pick up a lovely souvenir Navajo Rug.